The Civil War was still raging in September 1863 when the first horse-drawn trolley cars rolled down the streets of Worcester. 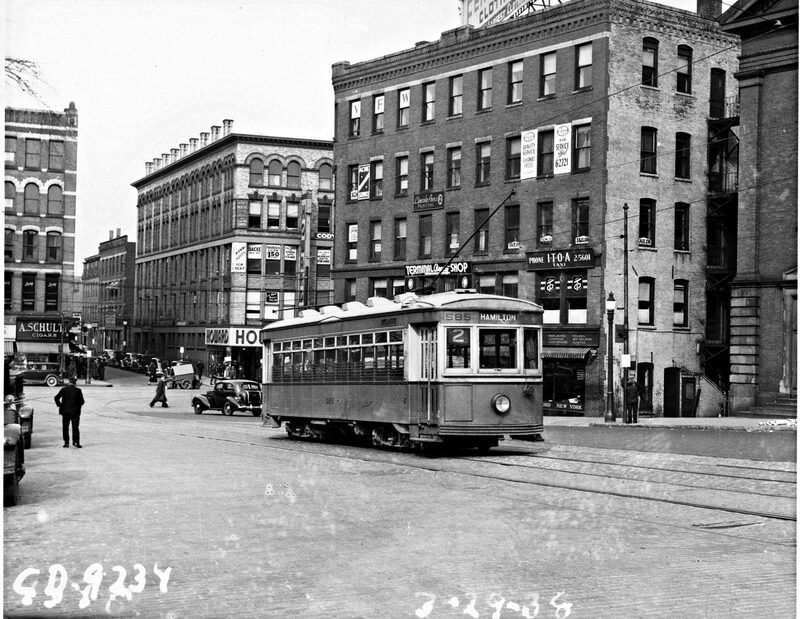 By 1900, a system of light rail connected not only the neighborhoods within the city, but communities across Massachusetts and into neighboring states. At its height in 1916, the Worcester Consolidated Street Railway Co. was the largest in the state with 429 cars, more than 300 miles of track and 72.7 million fares. A 1902 map published in the Sunday Telegram of the electric rail network. The first electric trolley cars were introduced to Worcester in 1891. The streetcars were a big improvement and service expanded rapidly. The system was a mishmash of different trolley and railroad companies that formed a transportation network across Massachusetts and into neighboring states. Today we think of transit as a government responsibility, but in the 19th and early 20th centuries rail was run by for-profit corporations. In the beginning, many of the companies were small and some were even created to run a single line. The Boston & Worcester Street Railway operated 32 miles of track, from 1903 to 1930, between Shrewsbury and Brookline. On either end, passengers would transfer to another company’s trolleys to take them to their final destination. In a time before highways connected both cities, it took about 2 hours and 20 minutes to travel from City Hall in Boston to City Hall in Worcester. Main Street administration building, 99-109 Main St. The Worcester Consolidated Street Railway was the city’s largest. In 1906, it was purchased by Cornelius Vanderbilt’s New Haven railway and over the years combined with other surface railways in Springfield and Boston. 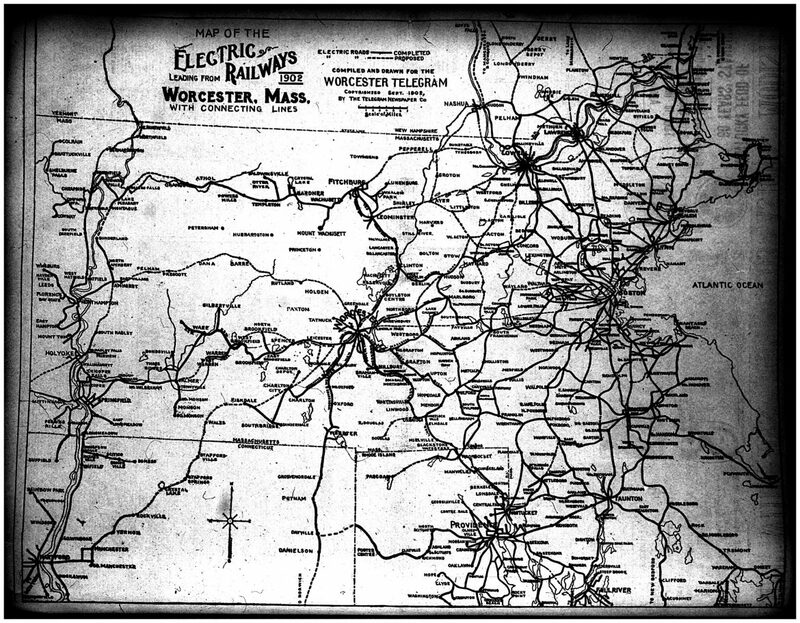 Its network included urban lines that ran throughout the city, as well as a network that connected Worcester to other county cities and towns such as Fitchburg. The company built a steam-powered electrical plant in 1911 on Providence Road in Millbury to power its system. Financial woes began to batter Worcester Consolidated by the mid 1920s. In the first nine months of 1926, the company lost $200,000. Most of the unprofitable lines were discontinued and county service was reduced to Webster, Southbridge, Fitchburg, Grafton and Woonsocket, R.I. In one case, the rails were even removed and sold to build a railroad in Egypt. 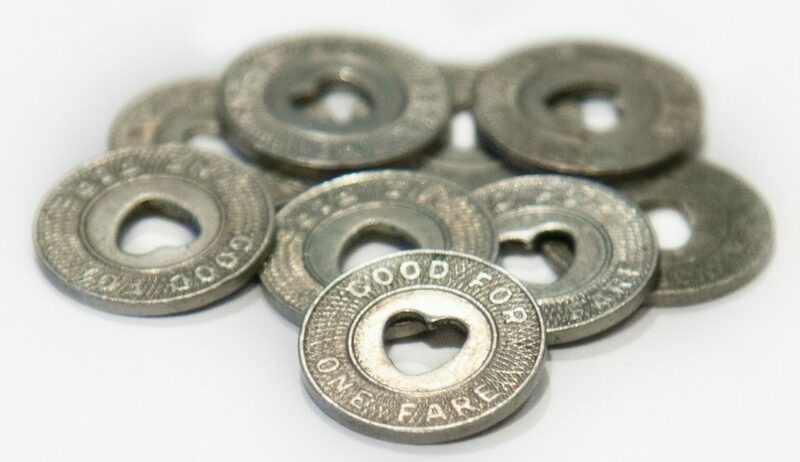 Trolley tokens from the collection of the Worcester Historical Museum. The Worcester Telegram estimated in 1926 that the trolley system needed $1.6 million (equivalent of $21.7 million today) for new cars, track improvements and a new maintenance facility at Grove Street. Worcester Consolidated issued bonds to undertake the project. The Grove Street facility is the same one currently being used—and soon to be replaced—by the Worcester Regional Transit Authority for bus maintenance. Complaints of slow service and poor equipment continued to mount. 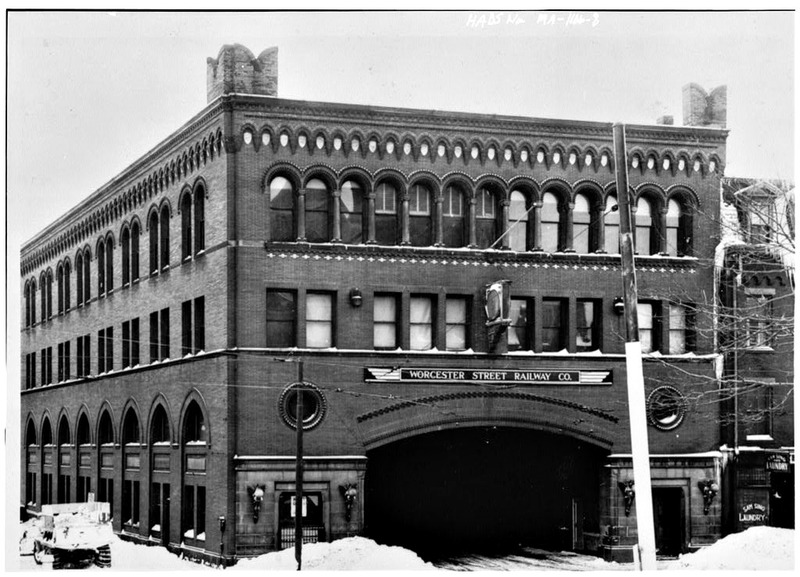 In response, Worcester Consolidated contracted for 100 new cars in 1927 to be built by Worcester’s Osgood Bradley Car Co. and Springfield’s Wason Manufacturing Co., which had become the nation’s largest builder of railroad cars and locomotives. The new cars were state of the art and included high-tech features such as automatically opening rear doors. News reports gleefully noted the new streetcars greatly increased efficiency and leap-frogged Worcester over the Boston Elevated Rail Co. Unfortunately, these changes seemed to have done little to stem the loss of ridership. By the late 1920s, Worcester Consolidated was put up for sale by the New Haven Railroad. There were no takers, however, and the company went into receivership in 1930 after it defaulted on $4.8 million in bonds. In the end, economic realities undid the trolley system in Worcester. Over time, the company added bus routes to take over lines with high overhead and low ridership. In 1942, it announced it would end all remaining trolley service over the next three years. 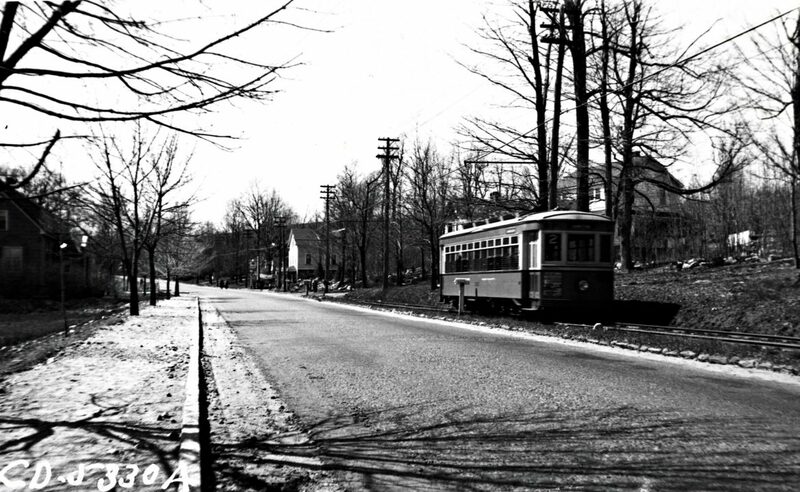 On Dec. 31, 1945, the final trolley left Leicester at 1:36 a.m. for downtown. The driver, Leopaul Snyder, made the front page of the Telegram and is remembered as the last trolley driver in Worcester. Shortly after it ended service, the company sold many of its streetcars to Brazil for use in Rio de Janeiro. Over the years, trolleys and trains have captured the imagination of millions. There are several museums dedicated to trolley preservation and one of the most popular attractions at Lowell National Historical Park is the restored trolley that runs between the park visitors center and Boarding House Park. 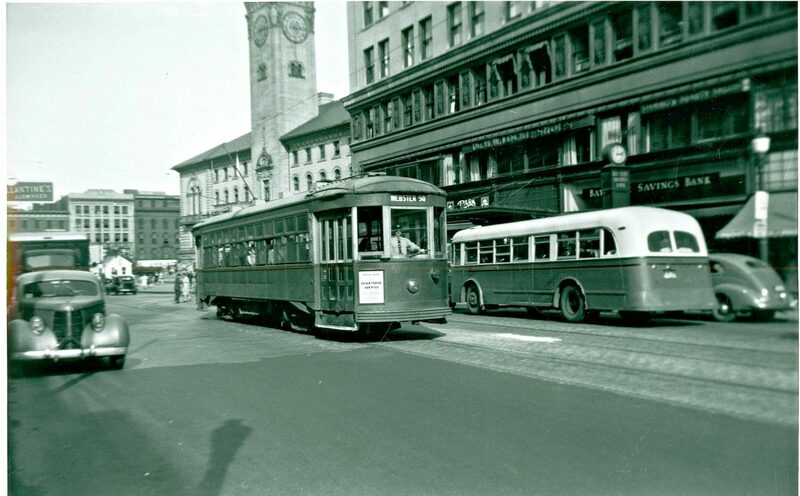 In the 1940s, both trolley and bus transportation were run by the Worcester Street Consolidated Railway Company (September 1945, Main Street at Franklin). As the home to trolley manufacturer Osgood Bradley and later Pullman Standard, Worcester played an important role in the history of passenger rail travel in the United States. With its name choice of Worcester Railers, the city’s new hockey team seeks to reclaim a portion of that legacy. Even the Osgood Bradley building is being preserved and transformed into housing units for about 250 college students. Knowing what we know now about urban planning and transportation, one cannot help but wonder what the city would be like if trolley service had survived. Would it be similar to the MBTA’s Green Line in Boston, or more like the historical trolleys in Lowell or Memphis, Tennessee, and of course San Francisco? At the end of the day, bus service turned out to be the more economical choice for Worcester, but unfortunately it lacks the romance and identity of riding the rails. David DuBois writes about Worcester history for Worcester Sun and his own website. He holds a master’s degree in history from Clark University. Follow David on Twitter @davidjdubois. David DuBois writes about history for Worcester Sun and his own website, https://worcester.wordpress.com/. He holds a master’s degree in history from Clark University. When not buried in books, he enjoys playing music, cooking, motorcycles and brewing beer. Follow David on Twitter @davidjdubois. Is there a place where records for the WRTA ,especially 1900-1925 would be archived? I left Worcester January 1955 joint the air force spent 38 years now-retired and live in the Phillippines for the past 45 years. I remember leaving the boys club going down to the main street jumping on the outside rear of a trolley for a free ride. Worcester a great city with a heart of gold. how i do remember the trolly barn on Main st.then later in years it turned into the Telchrone watch company this was backin the 1957 area.linclon square was my hangout as a kid, new every tunnel under the city right thru linclon square down to washington square.fromthe park over on park ave. you could go to the art musiem free, all the bird musiems on salsbury st across from the boys trade school. well befor the tunnel was ever thought of. igrew up by the old doctors hospital back then i sold news papers called the boston record on every corner in worcester from like 6/30 pm till 12pm.and oh how the bookies came for that paper.the mutual numbers were the numbers of the day caomeing from the last three numbers of the daily endings from the goverment. oh to go back to them days.when you,r local priest would chase you down to get to church,then my man old father Harrington hou then became the big man the bishop of worcester.